Depending on who you ask, President Obama added anywhere from $983 billion to $9 trillion to the national debt. Who's lying? None of them. There are three ways to look at the debt added by any president. The first, and most common, method is to subtract the debt level when he took office from the debt level when he left. The second, and more accurate, method is to add together his projected budget deficits. The third method is the fairest but also the most complicated. It adds just the deficits created by the president's specific initiatives. Review these three methods below. Then, you'll be able to win any argument made about how much President Obama added to the national debt. The largest number comes from calculating how much the debt increased during Obama's two terms. On January 20, 2009, when he was sworn in, the debt was $10.626 trillion. On January 20, 2017, when he left, it was $19.947 trillion. It explains why most people say Obama added $9 trillion to the debt, more than any other president. The second method is to add up all of the budget deficits incurred while Obama was in office. But it's a little misleading to hold any president completely accountable for the deficit incurred during the first year. Most of that deficit rightfully belongs to the previous president since he created the budget. President Bush's last budget, for Fiscal Year 2009, created a deficit of $1.16 trillion. That fiscal year began on October 1, 2008, and continued until September 30, 2009. Although most of that deficit occurred after Obama took office, it was a result of Bush's budget. Similarly, the first deficit that occurred after President Trump took office was due to Obama's last budget. Here are the deficits by year that can accurately be attributed to Obama. FY 2009 - Even though the budget had been approved, Congress added emergency funding to stop the Great Recession. It added the first year's spending from Obama's Economic Stimulus Act to the FY 2009 budget. That $253 billion accrues to Obama. FY 2010 - Obama's first budget created a $1.294 trillion deficit. FY 2011 - This budget deficit was $1.3 trillion. Defense spending hit $855 billion. Republicans stalled on raising the debt ceiling, creating a debt ceiling crisis. FY 2012 - The deficit was $1.087 trillion. FY 2013 - This was the first Obama budget where the deficit, $679 billion, was less than $1 trillion. Thank sequestration. It forced a 10 percent cut in spending. FY 2014 - The deficit was $485 billion. Tax revenue rose to $3.02 trillion. FY 2015 - The deficit fell further to $438 billion. FY 2016 - The deficit rose to $585 billion. Congress added $58.6billion to pay for the Afghanistan War. FY 2017 - The deficit was $665 billion. Congress added $100 billion to Obama's budget request after Trump took office. The deficits from all these budgets total $6.785 trillion. But, like most presidents, Obama's contribution to the debt was higher. There's a difference between the deficit and the debt by president. All presidents can employ sleight of hand to reduce the appearance of the deficit. They can borrow from federal retirement funds. For example, the Social Security Trust Fund has run a surplus since 1987. There were more working people contributing via payroll taxes than retired people withdrawing benefits. The Fund invests its surplus in U.S. Treasury notes. The president can reduce the deficit by spending these funds instead of issuing new Treasurys. As a result, Obama added $8.588 trillion to the debt. Is it fair to blame any president for events over which he had no control? During Obama's terms, there was less federal income than usual. The recession and the Bush tax cuts reduced tax receipts. At the same time, the cost of Social Security, Medicare, and other mandatory programs continued to increase. The fairest method is to measure the debt incurred by Obama's specific policies. The Congressional Budget Office does this for every program. The CBO found that Obama's largest contribution to the debt was the Obama tax cuts, which were an extension of the Bush tax cuts. They added $858 billion to the debt in 2011 and 2012. Obama increased military spending from an average of $500 billion to $800 billion a year. 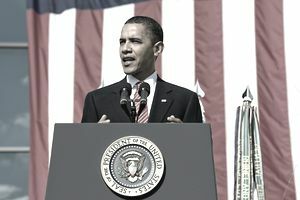 In FY 2011, he set a new record of $855 billion in FY 2011 set a new record. Obama spent $807 billion on the wars in Afghanistan and Iraq. That's almost as much as the $1.16 trillion Bush devoted to the War on Terror. What about the Patient Protection and Affordable Care Act? It didn't add anything to the debt in Obama's first term. Most of Obamacare's costs began in 2014 when the health insurance exchanges opened. It also extended coverage to more low-income people that year. But Obamacare's tax increases offset its costs to the tune of $104 billion between 2010 and 2019. Congress and Obama also negotiated the sequestration budget cuts. That cut the deficit by a small percentage. When all these are added up, Obama's debt contribution was $983 billion, according to an analysis by the Washington Post.